One of the first patients in Scotland to receive a new lung valve has spoken of the huge improvement in her quality of life. Patricia McCall had tiny valves inserted in her lungs to treat her emphysema. The procedure is an alternative to radical surgery in which diseased parts of the lungs are cut away. 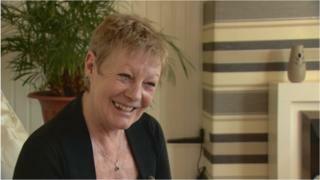 Ms McCall was treated at the Golden Jubilee National Hospital in Clydebank as part of a clinical trial. The hospital is the first in Scotland to fit the valves. The valves are made from titanium and silicone and could be suitable for up to a third of emphysema patients. "Before, it was like someone had their arms round you and was just crushing you," said Ms McCall, "and it was like someone else had their hands over your mouth. "Now I look and feel 100 times better. It has been a godsend." The tiny one-way valves block the airflow to diseased parts of the lung, whilst improving the flow of air to healthy parts. They are implanted via the mouth and throat, which means there are no scars. Consultant Lung Surgeon Mr Alan Kirk said: "Our clinical study on these one-way valves has found that after treatment patients will breathe far more effectively, making their quality of life much better." Since the operation last May, 58-year-old Ms McCall has been able to book her first holiday in a decade. She said: "It has been so long since I last went on holiday and I am really looking forward to getting away, but it would not have been possible without the valves. "I never thought I would get on an aeroplane and be able to go away ever again because of the problems with my lungs. "I have bumped into old friends since the operation and they have all said I look fab and that it is great to see me out and about." It is hoped the "Endobronchial Valve" will dramatically improve the quality of life for people with lung disease. Emphysema is usually caused by smoking and is very common in Scotland. Mr Kirk wants more doctors to refer their patients for the procedure as part of the trial. "We really want to improve awareness of this procedure and receive more referrals from GPs and hospitals," he said. "We are confident that long term this procedure may be an alternative to more invasive surgery for patients suited to this treatment."